MySpace Facebook YouTube Flickr Flock! Flock –The Social Web Browser - is built on Mozilla’s Firefox codebase. 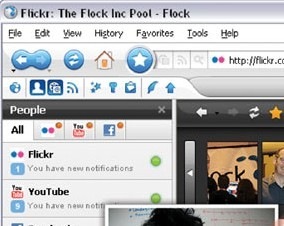 Flock is designed to easily connect you with your friends on a variety of social services such as: Facebook, YouTube, Flickr, Twitter, Digg and Pownce. Flock also makes sharing photos, videos, and content extremely easy via simple drag and drop actions across the 20 available services. Of the many popular features in Flock, integrated WebMail support for Gmail, YahooMail and AOL Webmail services make staying on top of your communications convenient and easy.